Ground Cover fabric is referred to by several names as it was developed with having one purpose: to lure moisture into the soil and to help restrict weed growth. IT IS HIGHLY USED IN AGRICULTURE AND HORTICULTURE INDUSTRY. Ground cover fabric is tough and tear resistant and is the ideal product for creating footpaths and weed free surfaces around gardens and in the greenhouses. Woven using high tenacity polypropylene yarns forming a dimensionally stable network, which maintains the relative position of the yarns. 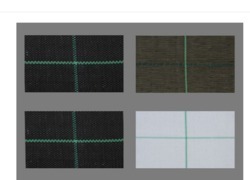 Our Geotextiles offers these horticultural fabrics i.e. ground covers of various specifications customized as per the requirements of the clients. Ground cover fabric comes in rolls of 300 lengths and is availible in 3, 4, 5, 6, 10, 12, 15 and 17. 5 widths. Has green lines running down the length of the fabric 12' apart to make overlapping easier. Great way to keep the weeds out of your way and achieve a nice looking, weed free flower or plant bed. 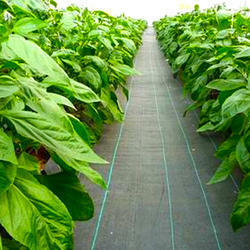 We are major supplier of PP woven Ground Cover in India. Ashirwad Botanica offer Ground Covers that are fabricated from premium quality raw material. These are used to protect the soil from erosion and inhibits weeds. Fabricated from high tensile strength material, they can withstand extreme climatic conditions. Clients can buy these excellent solutions from us at industry leading. IDEAL Woven Weed Control Mulch Fabric are water permeable and much stronger than spun-bonded polypropylene fabrics. With our rich industry experience and knowledge, we are engaged in manufacturing, exporting and supplying high quality Woven Ground Cover. Our dexterous professionals design and fabricate this cover utilizing exceptional quality UV stabilized polypropylene flat tapes and most recent techniques at our hi-tech fabricating unit. Green Image Farm And Nursery pvt. ltd.
We are engaged in offering our clients with a comprehensive range of Ground Covers. These covers are using high-grade raw material at our vendors end. Our vendors also ensure to adhere to the prevailing industry standards while making these ground covers. Available at reasonable prices, our product range can be customized according to the specifications given by our esteemed clients.